Since the K-Lite Codec Pack is my media software of choice, I decided to visit their site to see if there was an upgrade available. Indeed, the latest version at the moment of writing was released on November 19th 2015 (the version I was using had been installed on my PC at the beginning of November because I'd bought a new hard drive and reinstalled the OS). I've downloaded and installed the update, but nothing changed, I still got the same green square. Now, this part I am ashamed of; instead of getting suspicious, I did what the file suggested, i.e. ran it in WMP, which indeed suggested that I download some codecs. I let it do it, typed the admin password because my account is a regular one, and then a few interesting things happened. 15/11/22 3:35:38 PM Real-time file system protection file C:\Users\admin\AppData\Local\Temp\81448202922\1QVdFL1BTSQ==0.exe a variant of Win32/Adware.ConvertAd.ACN application cleaned by deleting - quarantined desktop\admin Event occurred on a new file created by the application: C:\Users\admin\AppData\Local\Temp\beeibedcid.exe. 15/11/22 3:35:35 PM Real-time file system protection file C:\Users\admin\AppData\Local\Microsoft\Windows\INetCache\IE\51L9SWGF\VOPackage1.exe a variant of Win32/Adware.ConvertAd.ACN application cleaned by deleting (after the next restart) - quarantined desktop\admin Event occurred on a new file created by the application: C:\Users\admin\AppData\Local\Temp\beeibedcid.exe. beeibedcid.exe had been running as a process before I killed it manually using the task manager. Even though ESET didn't touch it, it's no longer in AppData\Local\Temp. The UI differs in certain subtle ways, and the sentence composition/syntax is poor. Undeniably though the most suspicious thing is the domain in the upper left corner, playrr.co; a simple whois lookup reveals that the domain has been registered on November 17th this year - five days ago - and the registrant is WhoisGuard, so the actual registrant clearly wanted to conceal their details. I should add that the video I downloaded had been uploaded on 2015-11-22 13:29:23 GMT, roughly an hour before I downloaded it. The OS is Windows 8.1 Pro x64 and the AV is ESET Nod32 AV 7.0.302.0, with the latest signatures. 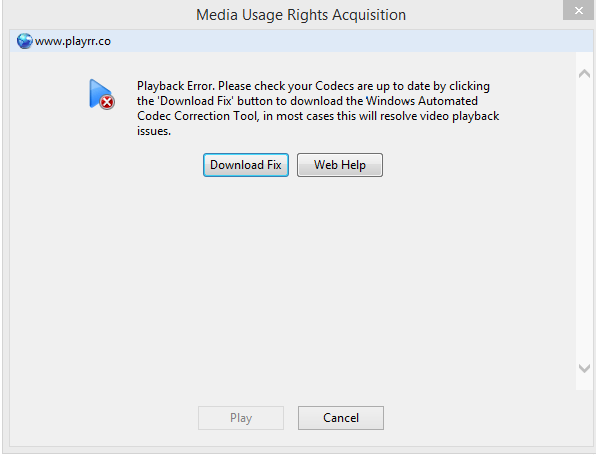 I'm annoyed at myself because this is a fairly obvious trap, but at the same time I'd never think to check Windows Media Player dialogs for obvious trojan/adware! No matter what it is, it seems to be a relatively new thing. What can I do to ensure others don't fall for this? I don't think any AV vendor would allow me to submit a .wmv file a few hundred megabytes in size for analysis. In this case, the feature has been abused to display a fake WMP error about missing codecs (it's in reality a webpage, as the domain name in the top bar suggests, and if it was real the window would've been much smaller) to make you click a (fake) button that points to malware masquerading as codecs. There's some more info about this DRM system on Wikipedia, and it seems to be deprecated in favour of PlayReady. Whether this new iteration will allow such abuse isn't yet known. The WMV file in question was probably crafted to exploit a vulnerability in Windows Media Player. The explicit request to use Windows Media Player to play it points in that direction. It was probably intended to steer victims away from other players which wouldn't be vulnerable to the exploit. 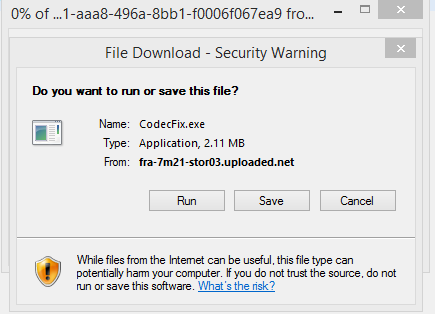 The vulnerability was then exploited to request download of a malware program disguised as a codec installation package, a popular ploy since users would expect codec installation when playing a media file. Not the answer you're looking for? Browse other questions tagged windows virus or ask your own question. How does Remote Access Trojan / Backdoor Software work? Windows “Send to compressed file” creates an image? How can one execute code upon entry of folder in Windows?